[ABRAHAM LINCOLN]. 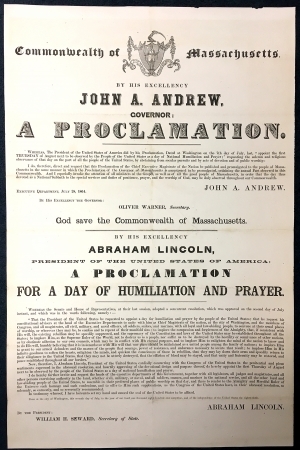 Broadside, “A Proclamation for a Day of Humiliation and Prayer,” July 7, 1864, printed under a forwarding Proclamation by Governor John Andrew of Massachusetts, July 28, 1864. 1 p. 18¼ x 27¾ in. With the outcome of the war still far from clear, this broadside announces to the people of Massachusetts Lincoln’s proclamation of a national day of prayer. Eight weeks prior, at Cold Harbor, Grant had lost some 7,000 Union troops in the span of 20 minutes. The siege of Petersburg was just six weeks old. Following the examples of presidents Washington, Adams, and Madison, Lincoln issued at least eight proclamations calling for days of humiliation, prayer, fasting, or thanksgiving. His proclamation of October 3, 1863, established the precedent of the fourth Thursday of every November as a national day of thanksgiving. Congress must have worried that this was not sufficient. They could not know then that Cold Harbor would be Lee’s last major victory. On July 2, 1864, Congress passed a joint resolution requested that Lincoln call for an additional day of “national humiliation and prayer.” Lincoln set the first Thursday in August 1864 as a day to pray for a speedy end to the war. It would be another eight months before that prayer was answered. I do, therefore, direct and request that this Proclamation of the Chief Executive Magistrate of the Nation be published and promulgated to the people of Massachusetts in the same manner in which the Governor of Massachusetts is accustomed to be promulgated, concerning the annual Fast observed in the Commonwealth. And I especially invoke the attention of all ministers of the Gospel, as well as of all the good people of Massachusetts, in order that the day thus devoted as a National Sabbath to the special services and duties of penitence, prayer, and the worship of God, may be duly observed throughout our Commonwealth. Executive Department, July 28, 1864. God save the Commonwealth of Massachusetts. A Proclamation for a Day of Humiliation and Prayer. Now, therefore, I, Abraham Lincoln, President of the United States, cordially concurring with the Congress of the United States in the penitential and pious sentiments expressed in the aforesaid resolution, and heartily approving of the devotional design and purpose thereof, do hereby appoint the first Thursday of August next to be observed by the people of the United States as a day of national humiliation and prayer. I do hereby further invite and request the heads of the executive departments of this Government, together with all legislators, all judges and magistrates, and all other persons exercising authority in the land, whether civil, military, or naval, and all soldiers, seamen, and marines in the national service, and all the other loyal and law-abiding people of the United States, to assemble in their preferred places of public worship on that day, and there to render to the Almighty and Merciful Ruler of the Universe such homage and such confessions, and to offer to Him such supplications, as the Congress of the United States have, in their aforesaid resolution, so solemnly, so earnestly, and so reverently recommended. In testimony whereof, I have hereunto set my hand and caused the seal of the United Stated to be affixed. Done at the city of Washington, this seventh day of July, in the year of our Lord one thousand eight hundred and sixty-four, and of the independence of the United States the eighty-ninth.